Happy Birthday to the iconic brand of classic American style. Recognized all over the world as a symbol of authentic American heritage and craftsmanship, Pendleton is celebrating 150 years of weaving fabric in the Pacific Northwest this year. Made in the USA. With six generations of family ownership since 1863, the company owns and operates two of America’s remaining woolen mills, attending to them with the love and respect they deserve with state-of-the-art looms and eco‐friendly technology. 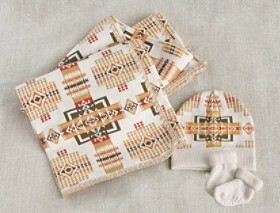 Inspired by its heritage, Pendleton designs and produces apparel for men, women and children, blankets, home décor and gifts. For Little Ones. 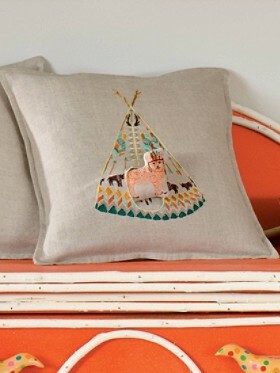 Pendleton’s colorful, beautifully designed and naturally inspired line of children’s blankets, towels, layette, plush toys, dinner sets and room décor can brighten your child’s environment with pieces that can become family heirlooms. 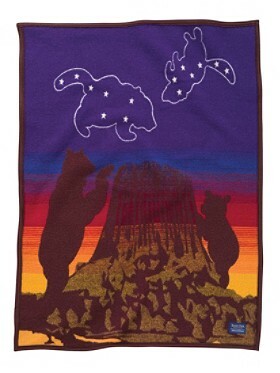 Each of the “Tell-Me-A-Story” blankets are inspired by the true history of the native peoples of America, giving real-life shared experiences to parents and their kids. Full stories for each blanket can be found on the company website. Ah-Day. “Ah-Day” means “special” in Kiowa, and the Ah-Day blankets are produced exclusively by Pendleton for the American Indian College Fund, a Native American-operated organization dedicated to education. 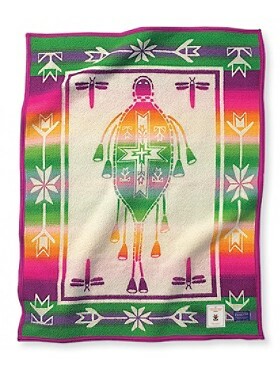 Designed by acclaimed contemporary Native American artist Virginia Stroud, the blanket is inspired by a Plains Indian tradition of new parents placing their child’s remaining navel cord inside an amulet shaped like a turtle. The amulets represent the turtle’s hard shell that will guard the spirit of the child and ensure a long, protected life. Also, a portion of the proceeds from the Ah-Day blankets benefit the Fund. Girl Scouts’ Centennial Celebration. Last May, Pendleton wove a custom blanket design for the Girl Scouts’ 100 year celebration, each one issued with a commemorative label signed by Girl Scout alumna and former Governor of Oregon Barbara Roberts. 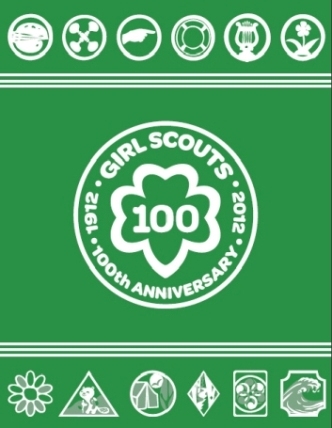 Adorned with a few of the original Girl Scout proficiency badges and the Girl Scouts official 100th anniversary logo, the blanket design represents the history as well as the diversity of skills that girls have learned in the last century. Stripes along the top and bottom represent the three parts of the Girl Scout Promise and the Courage, Confidence and Character element of the Girl Scout mission. 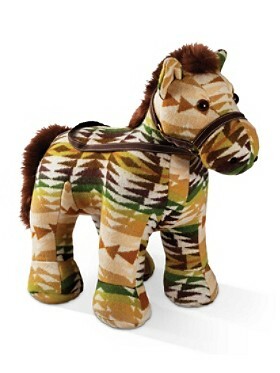 Pendleton is available through select retailers in the USA, Canada, Europe and Asia, at Pendleton stores, through company catalogs the Pendleton website.